JYJ have released their English album and it’s quite…something. Their English is better than what I expected and the album was substantially better than what I thought. 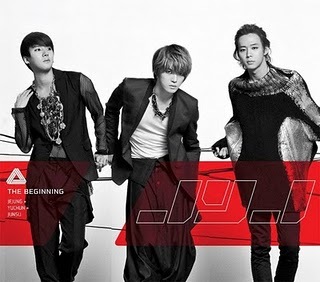 The Beginning was produced by American rapper, Kanye West and written by JYJ. I feel like JYJ and Kanye wanted this to sound more “hip” and so they had this kind of not really singing like how most fans know them to.Ayyy Girl has the ‘club’ feel to it.I do like Kanye’s intro, but it didn’t really go with the song and sounded like he just threw something together; not the best from him. The progressive ‘Ayyy’s is my favorite part of the chorus. All in all, not an earth shattering track, but not bad. Empty also has the club feel to it with a dash of techno.Has a melodic sound featuring piano and this is pretty much Yoochun’s song without me hearing much from Jaejoong or Junsu. Be My Girl is gorgeous and especially with my favorite instrument- the piano. I like the repetitive ‘baby’ Junsu sings. Here is Jaejoong’s song, Still In Love, and I’m not feeling it. The song is like a circle — it’s not going anywhere and so that makes it boring. Jaejoong does have a nice voice, but this isn’t the best song to show it off in. Junsu’s solo, I Can Soar is simply beautiful. Yes, it may be like the biggest ball of cheesiness, but I do love a nice ballad and it definitely has this inspiring feeling to it. Last solo is from Yoochun, I Love You, is not interesting. I like the element the strings add, but let’s face it Yoochun needs someone else to accompany him because his voice is nasal and it can get a bit whiny. Be The One is love. I can totally imagine them singing this in Korea and it doesn’t feel so forced to have the ‘American’ sound. This EP is all about taste; depending on what you like to listen to, some songs you may love ( you may love the entire thing), but I can’t really make that decision for you. I’d give this a 3.5/5 since I only really like 3 tracks. I absoultely love it. Wish I had reviewed it. >< Perhaps because I'm a long-time Cassie, I enjoy the album and think the whole album is great. Even the remixes. I love JYJ/DBSK and I’m a Cassie!! <3 I love their album a lot!! I love the songs especially Empty and Be My Girl!! Such a catchy and addicting song!! ^^ I love Junsu's Baby part in Be My Girl too!! XD JYJ/DBSK Hwaiting!